The Italianos opens in the summer and is a must if you like ice cream and a lovely way to end an evening of tapas. 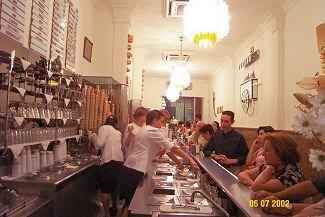 They do a wide range of ice cream sundaes as well as the ice creams. There is a massive list above the bar with all their specialities. There are tables where you can sit outside but they are very hard to get. If you don't fancy sitting down, then you will need to go inside to buy one. There's a ticket system operating, so you decide what size cone or tub you want and pay beforehand at the cash register in the middle of the bar. You then order your ice cream from one of the people serving. I chose the three chocolate ice cream flavours and my daughter Sasha had a melon and raspberry one. It was really scrummy. Obama would have loved this place! 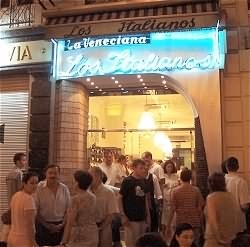 This place is located on the Gran Via de Colon, just down from the big Christopher Columbus statue. It is very busy, particularly in the late evenings. At midnight on a Sunday, we had to push our way in through the crowd. The ice cream was great, and surprisingly, a small cone was only 1 euro.